The following story is about Wakima, Sachem in what is now Woburn, Massachusetts. Wakima fell asleep along the shore at Horn Pond, and a glowing ship appeared and floated across the pond towards him. A beautiful form aboard the boat instructed him to stop his tribe from worshipping lesser Gods than the Great Spirit. This ghost or vision said that if he made this happen, the fish and animals would be abundant in the forest, and something special would happen that following August. The story tells of how the island in Horn Pond was magically formed. It may be considered a ghost or even a UFO story. Horn Pond today does contain one small island. During the days of the Middlesex Canal, the island was much larger, and people would stop on the island for recreational purposes. 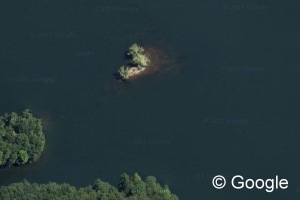 THERE was no island on Horn Pond, Massachusetts, in the long ago. When it was Lake Initou the [Native Americans] worshipped so many lesser Gods that they had no time to praise the one Master of Life. So it chanced that signs of anger were seen on the earth and in the heavens. Lake Initou, Mirror of the Spirit, was dark and troubled even in the calmest weather. Flashes of light and unaccountable sounds were seen and heard on Towanda and Mianomo [Rag Rock Mountain]. Then the game fled away, the fish grew scarce, the roots and berries suffered from a blight. As Chief Wakima lay in sleep on the lake shore he saw through his closed lids a growing light, and, opening his eyes, beheld a luminous boat advancing, self-driven, across the water, bearing a tall and beautiful form that also shone in white. The chief sprang to his feet in amazement, but sank to his knees again in awe when the boat grounded on the beach and the messenger stood before him, looking down with a face of sorrow and rebuke. The shining one said: "You pray to the air, to the lake, to the trees, that your people may not suffer from disease and hunger, from the heat of summer and the winter frosts. You do not appeal to the Spirit that rules all lesser ones and all the earth. Are your prayers to the manitous of the woods and waters answered? No; you have only sickness, famine, disappointment. Bid your medicine-men [to] stop their follies, their shaking of rattles, their chants, their ceremonies, and address their words to Him who bends from the clouds to listen and is sorry to hear no voice of His children. When your people have prayed properly, gather them at the water-side, and if you have been true and good the Great Spirit will give a sign that He loves you." Wakima raised his head to answer, but found himself alone. The vision seemed like a dream. Yet in his heart he knew he had offended. He would obey the shining one. He told his prophets what had been told to him, and ere long the game returned to the hills, the fish to the waters, the fruits were sweet and plenty, and the young grew fast and strong. When the Moon of Flowers had come [in August] Wakima recalled the promise of the messenger and gathered his people on the lake in their canoes to wait the sign. Gradually the boats, as of some will of their own, drifted into a circle, and in the middle of this ring, deep down, a light began to glow. It became brighter and brighter as it neared the surface, and presently arose in the air a gigantic swan, that shone with a glorious white light, as silver would shine in the sun. It spread its vast wings till they covered all the tribe as in token of blessing; then it settled on the water again and sank, the light paling as slowly as it had grown. When it had disappeared something dark arose silently from the lake, and in the morning an island stood there—the island that the red men called the Swan. The moral of the story is similar to the First Commandment in Christianity, "Thou shalt have no other Gods before me," or to not worship false idols and be true to only one God.